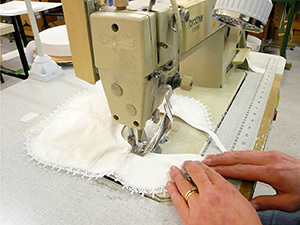 Kosi Kare have been manufacturing towelling and other products for over 30 years. Although towelling products are our main core whether our own products or contract manufacturer we have experience in the manufacture of many other products from cushions, to fleece jackets and dim out curtains. 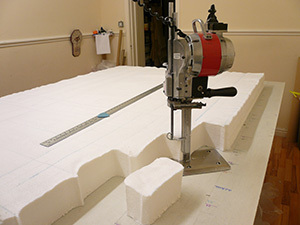 Throughout our 30 years we have manufactured bathrobes (through agents) for Harrods, Dorma Group and Paul Smith even making the packaging for Harrods bathrobes to be sold in. 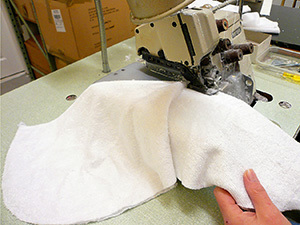 We have also manufactured and embroidered bathrobes, bath mat cases, laundry bags and slippers for large hotels such as Savoy group, Hyatt Carlton Tower, Cliveden, Gleneagles, St Andrews and Le Royal 5 Star hotel in Luxembourg amongst many more. At Kosi Kare we also manufacture baby's bibs including printing the pvc for some styles and for one customer in particular, who is the equivalent of Mother Care in the Middle East. 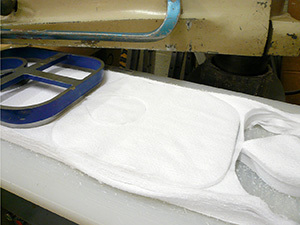 We have on site a hydraulic click press and with the use of knives the above bibs can be cut precise in high quantities quickly. 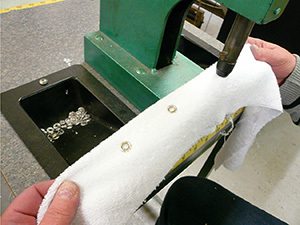 We have a variety of machines that do particular jobs, even adding press studs to your garments. Kosi Kare are trusted by Companies who need extra sewing capacity at short notice with a quick turnaround on items for customers such as Marks & Spencer and Sainsburys. We also offer a re-labelling and packing service.